April 8th 2018 Calgary, Alberta, Canada- The image on the right was brought to you by an exceptional effort in Gracious Professionalism, but it is a small part of the story of what happened this weekend. This weekend a large part of Nelson Mandela was taken by this Gracious Professionalism as they prepared the event. 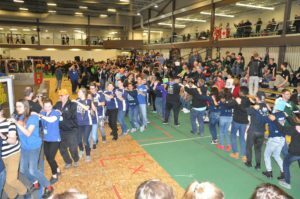 Mandela students poured over to Genesis Centre and helped set up a monsterous event that was, at its core, a large STEM conference. This included the pit area, the arena itself and the professional audio/video setup. Three of our students Fahad K, Eghosa O, and Rubeen S were instrumental in being the camera crew for the setup and all of the matches and ceremonies that went with this event. Jonathan P was also instrumental in volunteering his time to set up and then help run a number of tables through the three day event. 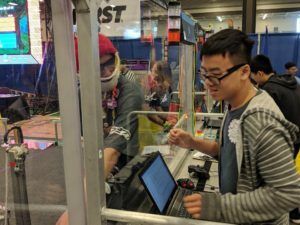 As we unpacked the robot and set up our pit on Wednesday night the Gracious Professionalism began. Students from Mandela went about welcoming all of the other teams to Calgary, teams that had travelled from as far as Istanbul, Mexico and Hawaii. As We began our preparations and practices on Thursday we dispersed team members to anywhere in the pits where they were needed. 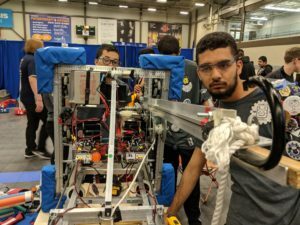 We helped the Turkish team (picture on the right) by donating a set of robot batteries because it is difficult to ship those across international borders. We helped Pearson by lending them our power drill, and we then had a special request. The Turkish team also had a special visitor as Emine from Mandela visited them in order to act as their translator and ambassador while they were in Calgary. Team 1622, Spyder from San Diego California had run into a snag. When they got there Thursday, with twelve hours to prepare their robot, there was n o robot. Upon further investigation it was revealed that the robot was currently sitting in Edmonton. 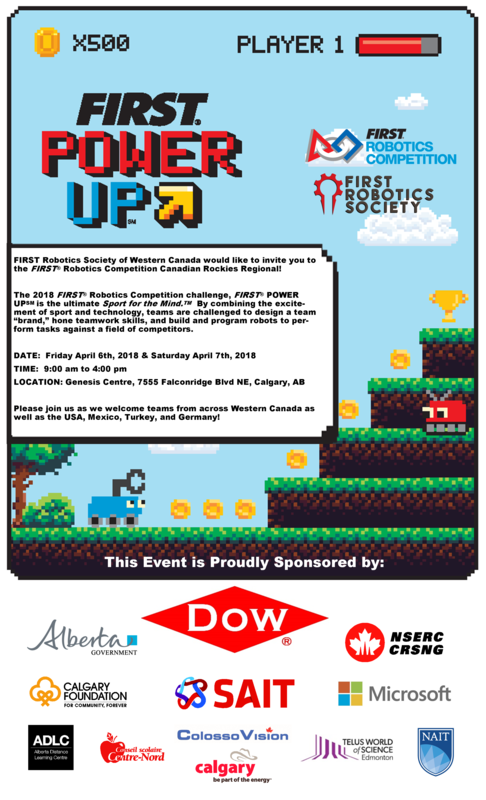 Now not to besmirch the reputation of our neighbours to the north, but that is no place for a robot when the Canadian Rockies Regional Championship are happening. 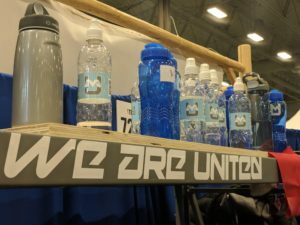 We negotiated with the judges and determined that if they could modify a robot, they could compete so we donated Wheels. Wheels was our practice robot from earlier in the year. The one that shot the yellow balls at the pep rally. Poor Wheels was disassembled and re-engineered for competition right across the pits from us. As the day ended we had a working robot, and we got to see the elation from team 1622 as their robot emerged, chilled from the semi-trailer, 24 hours late but intact. Poor Wheels will need to wait for another day before he sees the competition arena again. 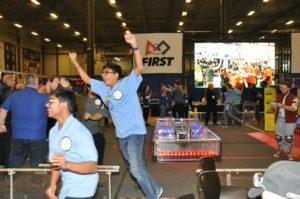 As we closed down the pit after the practice day and 12 hours of frantic robot modification, maintenance and practice there was a sense of relief and hope in the pit. 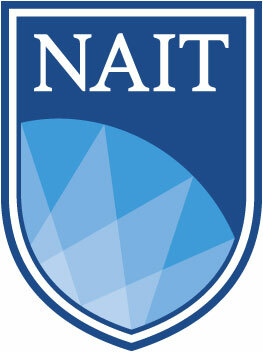 We would compete on level terms with teams that had been doing this for 20 years as Gracious Professionals. It is fast. Matches last two and a half minutes and then the next match comes up. Sometimes you have minutes between matches to tighten bolts, change bumpers, and bash parts back into working order. It is also big. 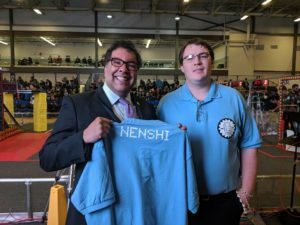 We started the morning with an address from Mayor Nenshi and an acknowledgement of the land by Jozie P and Mimi F followed by Mandela’s first ever FRC match. 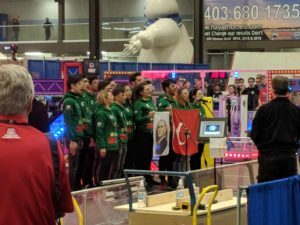 In that match we were paired with team 6188 from Fort Saskatchewan and team 6435 from Turkey. We got crushed 369-182 by an alliance that included Team 4733 from EP Scarlett in Calgary. 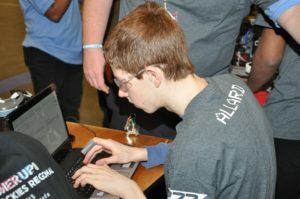 As we got back to the pits the programmers blamed the mechanical team while the mechanical team blamed the programmers for the robot not working properly. It was then that someone pointed out a dangling wire that had fallen off. I felt bad for the electrical team at that point. They did their trig and the hook was better for it. As the day progressed we had technical troubles in almost all games. Bumpers fell of one game. The programmers uploaded code that didn’t work in another. The battery didn’t get swapped before one back-to-back match. The drivers started arguing one match and drove in circles for half of the match. By t their role more than once. It’s funny what the accountability of a team can do to cementing your responsibility on a team. We played our last match of the day (click the link for the video), a rousing victory with our juggernaut teammates team 2122 the Tators from Boise, Idaho to a 365-165 score. We were 4-4 at the end of day one. Each part of our team had messed up a game, but had learned well what it meant to work as a team. As day three commenced everyone knew what we needed to do. We were ranked 29th out of 35 teams and knew we needed some wins. With that in mind the team removed the hook completely. That streamlined the robot and turned us into a good blocker and box mover. After three fantastic matches with only small technical glitches and gr eat driving we went into our last game ranked in the high 20s, likely not good enough to get us into the 24 team playoff. Lining up for the last match we were on an alliance with team 359 the Hawaiian Kids. the match was going well and we were in firm control when the team really hit their stride. 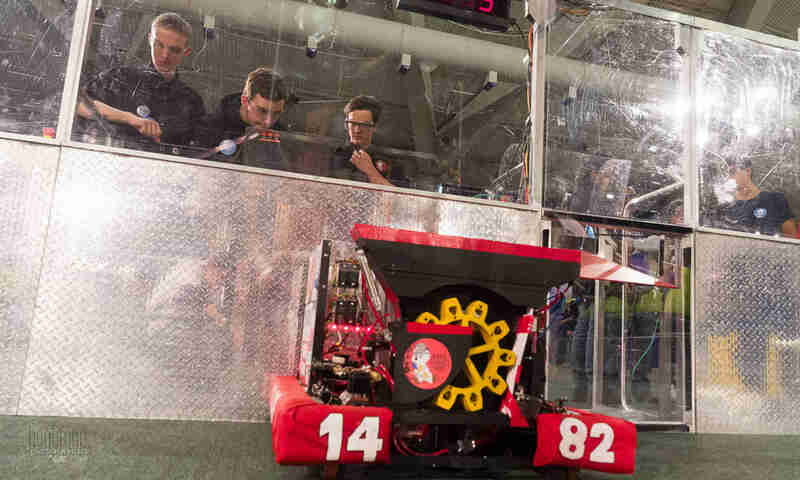 With 30 seconds left team 359 hooked onto the switch and deployed their “buddy ramp” a platform to lift us with them. As our driver lined it up he hit the ramp hard and didn’t make it onto the ramp; not giving up he realigned and gunned the motors for one last push. It worked and we were lifted up to get a full four ranking points from the match which hauled us up to be ranked 22nd of the 35 teams. Not bad for rookies. Now I’ve seen teenage boys cry before. Through break-ups and break-downs sometimes the waterworks turn on, but I don’t think I’ve seen tears of joy like I saw in our pits after that match and that result. Unfortunately, the FRC playoffs are not decided by ranking after the top eight or so ranked teams. As the picks happened and the Mandela team didn’t get picked the heads drooped lower and lower. 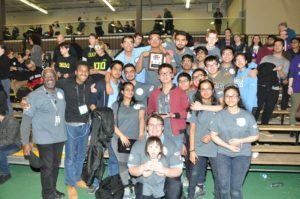 The 24th and final pick was made and the top teams selected Team 4733 from EP Scarlett for the top, and eventually Championship alliance. It takes a strong person to keep going after disappointment like that, but our team did. They marched back to the pits, put themselves on the alternate list in case another robot broke down and sat in their pit as other non-playoff teams packed up and shuffled out. 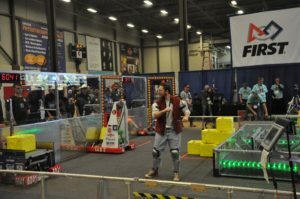 The playoffs were a blast with team 2122 the Tators, team 359 the Hawaiian Kids, and team 4733 EP Scarlett all taking the championship title. 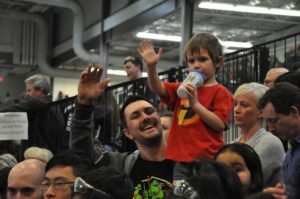 FIRST Robotics is about recognition and that was apparent while the awards were handed out. 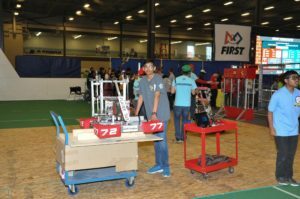 Our friends on team 1622 team Spyder took home a couple of awards for their fantastic operation and Ernest Manning Robotics team 4627 took home the Gracious Professionalism award for their work helping to build, wire and program a large number of team’s robots. As the teams from Lethbridge took the early rookie awards for Rookie Inspiration and highest Rookie Seed the Mandela faces were the lowest of the low this season. One of the last awards to be handed out at any FRC event is the Rookie All Star Award. 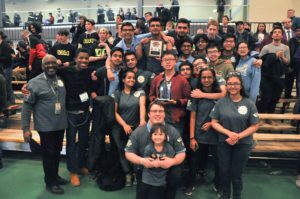 It is a special award because it is not only the most prestigious award for rookie teams at these events, but it also comes with an invite to the World FRC championships in Houston Texas at the end of the season, the largest single robotics event in the world. As the announcer went through the description of a team who was “always happy to lend a hand” and “who communicated and played well together” the team’s breaths were held…and when they mentioned that this team was a new school nothing could keep those seats on those seats. We won the Rookie All Star Award! We Won A Spot In Houston! So you’ve read this story this far, do you want to know where it ends? 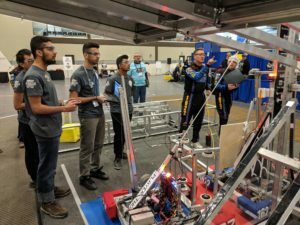 We have a few days now to try and assemble an envoy to represent team 7277, Nelson Mandela Robotics in Houston at the biggest high school robotics competition in the world and we need your help. Some of our students are able to rally the funds for us to get them to Houston for the competition but some cannot. 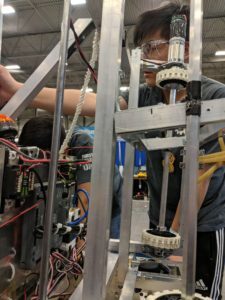 Keep your eyes on the announcements for some fundraising efforts and if any staff or students have connections at companies or organizations that might be able to help take the team to Houston, please mention them to your nearest Robotics team member. Mr. Harke is our most Gracious Professional. After spending the day on Canadian Forces work on Saturday he got a frenzied call that we had won an invite to Houston. 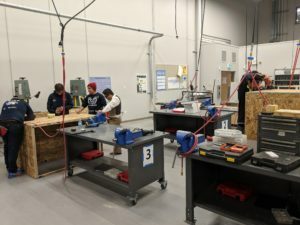 Mr.Harke has truly put in the time on this Robotics project, supervising the shop for many a late evening build this year.He drove over to the school on that snowy Saturday to help us crate up the robot and clean up. 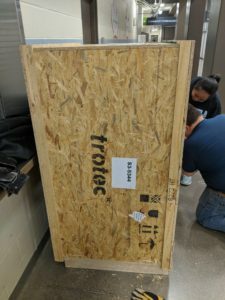 Lucky for us, our crate was easy, a repurposed crate from the new laser cutter which came in last week. Unluckily for two teams from Mexico, they didn’t have crates, and they likewise received unexpected invites to Houston. Cue the building monologue as Mr. Harke, Mr. Way and Ms. Way all helped the Mexicans build those crates as our students were long gone. We locked up the school at 1:30AM as security came to check on us, obviously worried for our well being, or our sanity. And with that the three of us hopped over to Denny’s to eat a meal that is neither breakfast, lunch, or dinner and celebrate the competition, the teamwork, and the Gracious Professionalism that is FIRST Robotics.